Supporting Palestinian liberation requires just one thing: upholding the right to self-determination. This June, the Israeli occupation of the West Bank and Gaza Strip enters its forty-eighth year. It’s the longest military occupation in modern times. For most of its life as a state, Israel has been ruling over millions of Palestinians, depriving them of civil, political, and human rights. Yet we can date the history of conquest earlier — to 1948, giving us an even longer period to consider: not only of the foundational expulsion and dispossession of most of the local Palestinian population, but also the subjugation of the small remainder who stayed behind by a historical fluke (and even fought to gain citizenship rights in Israel) and faced nineteen years of military administration, from 1948 to 1966. Even if we wanted to be overly generous about the nature of the Israeli state, ignoring its illiberal ethno-national self-definition and the violent early days of settlement before 1948, we would have to conclude that the only time that Israel wasn’t ruling over a Palestinian population whose political and human rights were denied was from 1966 to 1967. This was the brief period — from November 8, 1966 to June 5, 1967, to be more precise — when the military administration of Palestinian citizens had ended and the Palestinians in the West Bank and the Gaza Strip had not yet been occupied. To talk about occupation, then, is to talk about Israel. Given these ongoing colonial practices, the key question for Palestinian rights advocates is, how best can we help Palestinians achieve justice? This is not an easy question to answer today, in the absence of a clear Palestinian strategy for liberation that would organize mass political struggle in Palestine, set national priorities, and inspire (not control) outside solidarity. The call for Boycott, Divestment, and Sanctions (BDS) was made by Palestinian civil society organizations in Ramallah on July 9, 2005 in part as a response to this vacuum. Its main demand is to force Israel to “comply with international law and universal principles of human rights.” It’s a declaration that is becoming increasingly popular on university campuses, with some trade unions, and with other organizations in Europe and the United States. And now it includes an academic boycott, which has been spreading. Does this bode well for the movement for justice in Palestine? In order to evaluate BDS as a tactic, it is important to emphasize three things about the Israeli-Palestinian conflict — the political nature of Zionism, that of Palestinian resistance, and the role of international law. First, in order to understand Israel’s behavior as a state in relation to the Palestinians, we must see Israel as a settler-colonial project. It is a continuation of late nineteenth century colonization. And its main feature lies in wanting to expel rather than exploit the native population. In contrast to South Africa, for example, where black labor was crucial for state building, expulsion in Israel was key to state formation. For the Israeli state, Palestinians are basically dispensable. Jewish labor and Jewish land are key pillars of the Zionist project in Palestine. Like America’s manifest destiny, political Zionism justifies the conquest of Palestine through notions of historical-biblical right. Its thinking goes like this: the Jews are merely returning to reclaim the lands and properties that are already rightfully theirs. The non-Jewish population that lives there now just happens to be in the way. Why can’t they just leave? And if they don’t want to, we’ll make them leave by force, by political and economic suffocation, by many different means at our disposal that the world will either tolerate or ignore. Founded and nurtured by such nationalist extremism, Israel continues to want as much Palestinian land as possible with as few Palestinians as possible. This equation informs Israel’s daily colonial practices, and explains a lot about the Israeli-Palestinian conflict: 1948, the 1967 occupations, the annexation of East Jerusalem and the Golan Heights, the Oslo Accords, closure policies, the separation wall, the siege and wars on the Gaza Strip, and so on. All these things emanate from the politics of colonization and expulsion. Even Israel’s latest elections and Benjamin Netanyahu’s victory can be explained by recourse to Israel’s colonial frontier. What won Netanyahu the elections is blatant racism against Palestinian citizens of Israel and his denial of occupied Palestinian rights and statehood. Netanyahu was right. The Israeli-Arab conflict was, is and will remain the main item on Israel’s agenda. Not the cost of housing or banking fees, not even Iran’s nuclear program. Everyone would like cheaper housing, likeable banks and a friendly Iran. However, the Israeli voter does not define his or her identity and place on the political spectrum according to his attitude to Bank Leumi CEO Rakefet Russak-Aminoach or to Ayatollah Ali Khamenei, but according to his attitude towards Palestinians, the Arab minority in Israel and the settlements. This is the dividing line between left and right, between liberals and conservatives and to a large extent between Ashkenazi and Mizrahi Jews and between secular and traditional and religious Jews. Only in a settler-colonial society do attitudes toward the colonized play such an integral role in the national polity. Neither Iranian bombs nor housing and poverty generates that much consensus. Fear and loathing of Palestinians is easily mobilized by the Israeli elite in order to maintain its rule and national priorities. Colonialism is thus not only constitutive of state-formation and nation-building, but continues to determine the allocation of power, rights, and privileges in Israel today. What this means for the Palestinians is clear: Israel denies them security and statehood, cuts them off from its territory through a closure and segregation regime, controls their entrances and their existence in their towns and villages, cordons them off from each other and from the world, and leaves them oppressed yet unexploited as cheap labor — dominated, yet dispensable. No wonder Palestinians raise signs of protest saying: “We are not Red Indians.” Because that’s exactly what Israel wants them to be: devastated, scattered, and with no independent economic and political structures to speak of. But it is also important to emphasize Palestinian resistance. Palestinians have done nearly everything they can to stop, reverse, or slow down the colonization of their land and their dispossession. Historically, this has included both violent armed resistance and mass nonviolent popular resistance (e.g. the first Palestinian intifada), as well as political struggle and diplomacy. And since Israel always harps on about recognition, it is important to understand that the Palestinians have already done so: in order to achieve an independent Palestinian state in the 1967 occupied territories, the Palestinian leadership recognized the State of Israel in 1988 and publicly renounced violence. What the Palestine Liberation Organization (PLO) did back in 1988, Hamas is now being asked to do. Recognize Israel and we’ll negotiate with you, they are told. Yet what the PLO got in return for recognition was a more entrenched occupation, and a more extreme demand: now recognize the specific Jewish nature of the state. What the Palestinians didn’t get from Israel in return was a state, recognition of statehood, or recognition of their right to self-determination. When Palestinians in the Occupied Territories had a free hand to elect their representatives and opted for Hamas, Israel refused to accept the result, because it was the wrong answer as far as it was concerned. So Israel boycotted the government, encouraged the world to boycott it, and ultimately besieged and invaded the Gaza Strip several times. For Israel, Palestinian democracy is not a Palestinian right: it’s a privilege the colonial master grants its colonized population. Because its outcome is rather uncertain, why even risk granting it? Of the long series of Palestinian diplomatic concessions to Israel that began in the 1970s, the Oslo Accords were the worst. They essentially sidelined the one thing that Palestinians had in their favor: the fact that international laws and treaties pronounce the illegality of permanent occupation and “the impermissibility of acquiring territory by force,” and recognize the Palestinian right of self-determination and their right to a state in the West Bank and Gaza Strip. Oslo, in fact, violated international law: the word occupation never appeared, settlement was never banned, and the agreement turned a conflict over occupied lands into a dispute between symmetrical parties that had rights and obligations. Under the accords, the main right that needs safeguarding is Israel’s and Israelis’s right to live in security, and the main obligation of the Palestinians is to provide that. Oslo is not a peace treaty, but a security treaty that fortified what was supposed to be ended: the Israeli occupation. This raises the final issue of international law. The Geneva Convention stipulates that everything that Israel does in the 1967 areas, including building of settlements and walls, transferring its own population there, and changing its demographic and geographic character, is illegal. The practices of the Israeli occupation violate international law and are regularly condemned. Every year the call for a Palestinian state is renewed by the United Nations General Assembly (alongside the endorsement of the right of return for Palestinian refugees). What is clear, therefore, is that in the Palestinian struggle, international law is an asset, as it’s the one thing that can protect the Palestinians from Israel. The court also recommended that “further action is required to bring to an end the illegal situation resulting from the construction of the wall and the associated regime.” Even the one dissenter to the opinion, the US justice, agreed that the settlements were illegal. BDS can be seen as part of this necessary “further action.” The innovation of BDS is to raise the specter of global action against a state that so clearly and persistently violates international law through its longstanding occupation. What we have instead is not an arms embargo but the reverse: the arming of Israel to the teeth. Why? Simply put, because of the United States. Without the US diplomatic umbrella, Israel would be a pariah state. Like Israel, the US rejects the international legal consensus on Israel-Palestine. The US allows Israel to run roughshod over the Palestinians, trampling over those UN resolutions it didn’t succeed in blocking. The United States has its reasons for this support: no other country in the region (including NATO allies like Turkey) can be relied on to do America’s bidding as much as Israel (unencumbered by negative public opinion or popular political constraints against the US, as Turkey was during the Iraq War in 2003). Israel helps the US roll back nationalism in the region (Nasser is the best example) and forms of Islamic fundamentalism that are a threat to the US. Israel is also a source of potential force against Iran, and is allied with the Arab Gulf dictatorships in the region against democracy and popular mobilizations, as well. The US needs to manage and stabilize the region in this way in order to facilitate its control of oil, that stupendous strategic global resource. Israel and the Arab Gulf dictatorships are also big importers of major US arms, fueling the military-industrial complex in America. Where are the Palestinians in this network of alliances? Since the Palestinians don’t matter regionally these days, the US seems happy to let Israel manage its own colonial frontier with little real interference (the only thing it asks is to keep the illusion of the American-sponsored Oslo peace process alive). Why upset your strong and firm strategic ally over an issue that matters very little to you? So the US lets Israel humiliate and abuse Palestinians undisturbed. There is another way that the Palestinian issue is linked to Israel’s role in the region: the occupation and settlement enterprise give Israel good and solid internal reasons to remain a militarized society, and to continue boosting its military technology. Even though US interests in the region do not require the Israeli occupation, a militarized Israel is clearly what the US wants. What use would Israel be if it lost its Spartan features? So long as the Israeli occupation doesn’t contradict or seriously disrupt US regional interests, then both the US and Israel can work hand-in-hand to thwart peace and to block the implementation of international law and UN resolutions. BDS needs to be seen in this context. The pragmatic question for Palestine advocates to ask is this: why not utilize and mobilize international law when its implementation in the Palestinian case would mean beginning the process of ending the suffering of a long oppressed people? BDS is an effective tactic that nonviolently draws attention to the cause of conflict in Israel-Palestine: that is, to Israel’s colonial policies. It’s also a broad movement that has been gaining political momentum, especially in the West. Respect, protect, and promote the rights of Palestinian refugees to return to their homes and properties as stipulated in UN resolution 194. This, if you like, is the comprehensive list of Palestinian rights: no occupation, no denial of the right of return, and no state discrimination against Palestinians in Israel. The call is an important attempt to detail all historic injuries against the Palestinians and mobilize activists to support the Palestinians in their struggle for freedom. These are rights Palestinians have fought for throughout their history, and they have widespread support from Palestinians — myself included. Some of these rights are clearly unrealistic in current political conditions, and this is why they should not be turned into a loyalty list for solidarity activists. 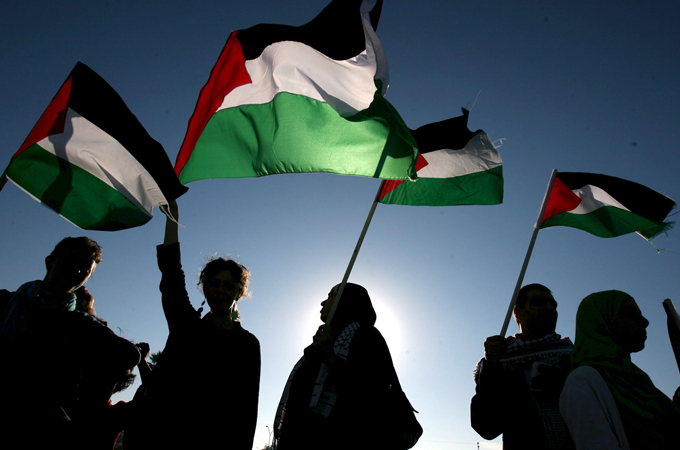 The Palestinian cause is an inclusive, democratic struggle that needs broad, popular support. The key question to ask is how we get as many people as possible to support the Palestinians, and how best to help deepen the commitment of activists and campus organizers to a just cause. To support the Palestinians and to be in solidarity with them requires just one thing: to uphold their right to self-determination. It’s not about holding potential supporters accountable to a list, but about regarding Palestinians as agents of their own emancipation, capable of rational political calculation and of democratic self-determination. It is up to the Palestinians to collectively and democratically decide what rights they can realize and uphold in current conditions and how best to conduct their struggle. And it is up to the solidarity movement to protect their right to do so. To assume that unelected civil society organizations and NGOs embody or exhaust Palestinian democracy is to assume too much. This means that there should be no preconditions for solidarity work other than the elementary one of upholding an oppressed people’s right to self-determination. It also means that so long as the solidarity movement does that, it should be free to decide how best to pursue that political objective. Local activists rooted in their own traditions of struggle know best how to organize and how to be most effective in helping the Palestinians realize their right to self-determination. In short, what the Palestinians need is a self-organized, democratic solidarity movement free of sectarianism, ideological vetting, and undemocratic practices. The Palestinians also need a movement that is ambitious enough to turn the international consensus over Palestine (that of ending Israel’s brutal occupation) into a reality. This is the first and core demand of all Palestinian political organizations, even of the Joint List of Palestinians in Israel and of Hamas, which for over a decade now has said that achieving statehood in the West Bank and Gaza is its main priority and would be reciprocated with a long-term ceasefire with Israel. Palestinians, like all peoples, deserve to live in peace and security, without daily harassment, invasions, occupations, wars, killings, siege, and collective punishment. The most urgent task now is to protect them from Israel and alleviate their daily suffering by ending the occupation. Breaking the siege on the Gaza Strip, and allowing reconstruction and free access to the outside world, is a crucial and tangible step. This is where BDS can be most effective, hitting Israel politically where it hurts the most — over its illegal occupation practices. Israel knows that the best thing to do about its occupation is not to talk about it, to distract from it and talk about another Israel, which mostly comes in the form of its foreign office-supported writers and models. The reality is that there’s nothing normal about Israel: no other colonial society I know of wakes up every morning and rules over millions of others by force, against their will, and pretends that it is okay. No other society I know of consistently supports its government’s wars against its occupied and dispossessed victims by an average of 94 percent. What other society has 94 percent of the population that agrees on anything? BDS is the best way to alert Israelis that their present society, where racism and occupation is routine, is abnormal. It tells Israelis that their leading companies and universities are complicit in upholding the longest occupation in modern times. It lets Israelis know that the IDF is not a defense army at all, but an aggressive colonial police, and that their troops and their settlers should return home. After forty-eight years of trying, the difficulties of ending the occupation are obvious. But it remains the most achievable task because it is there that Palestinians have most global support. If that is impossible, then nothing else is possible, and the status quo is permanent. Palestinians would then be destined to live walled in, dispossessed, and dominated forever. No reasonable human being should accept that for another people — it should violate our elementary morality and sense of justice. A democratic and effective BDS is one of the best ways to express this today. Ending the occupation remains the best route toward achieving the rights that Palestinians have long been denied. Thanks to Gilbert Achcar and Stephen R. Shalom for their comments. Bashir Abu-Manneh is a lecturer in the School of English at the University of Kent and a contributing editor at Jacobin .